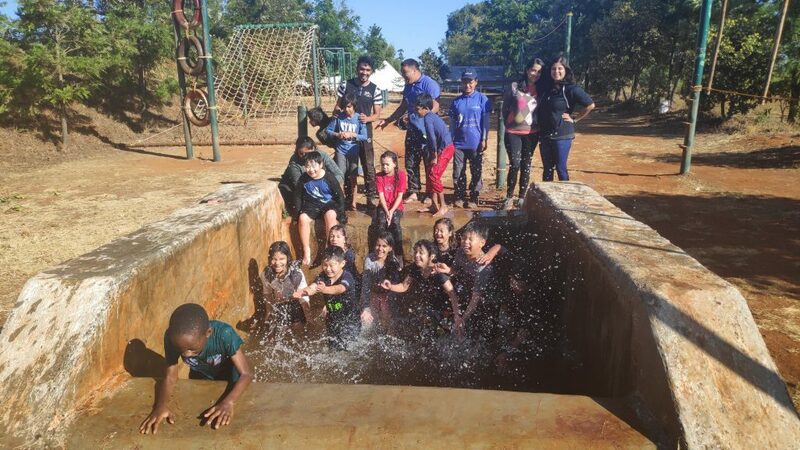 A bunch of enthusiastic students, a scenic location, a series of adventure activities, space exploration sessions and prancing around in strawberry fields – the perfect recipe for a NATVENTURE! 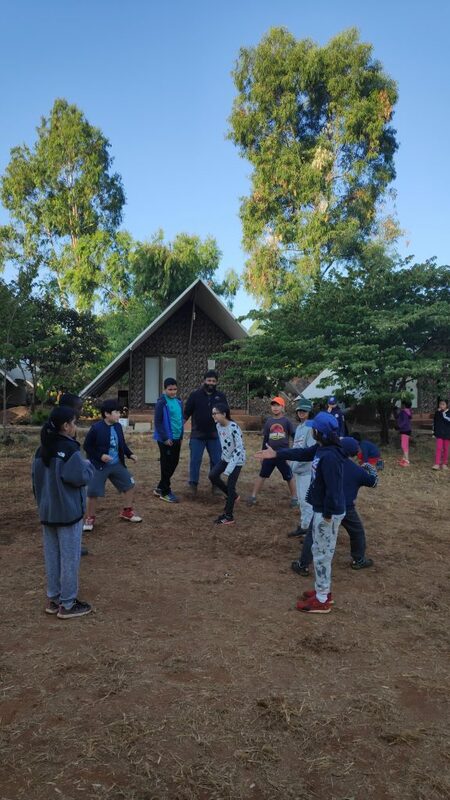 As PYP 3 headed towards the village of Bhilar in Panchgani, the bumpy village roads didn’t impact their excitement for visiting their campsite, which would be their home for the next two days. Once the children had unloaded their luggage, they were welcomed into the dining area, a revamped cow shed with colourful dining benches. After a quick lunch, PYP 3 set out to explore the surroundings and draft a map of the entire campsite, using their creativity to make a colourful map and flag for their ‘team’. 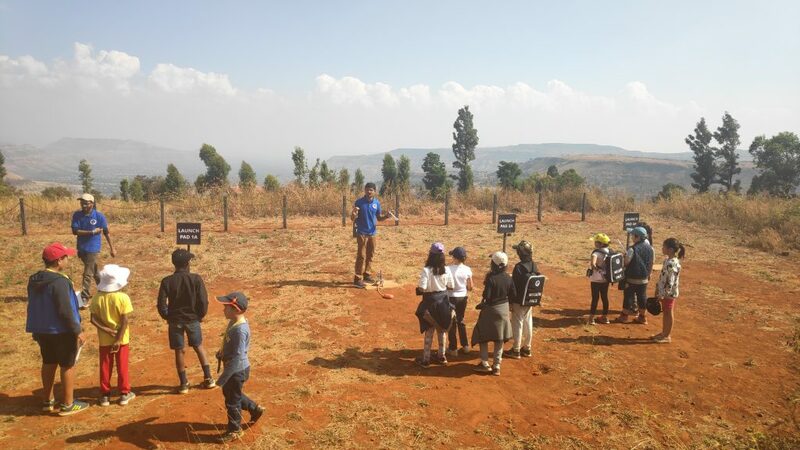 A couple of interactive games were played and the children enjoyed a quick walk over the ‘burma bridge’ and ziplined down the slope of land. Once it was sundown, they were asked to prepare a quick rice delicacy with the ingredients provided. With wood fires burning, the instructors helped the teams to place their vessels on the fire and this jungle cooking session showcased the improvisation and survival skills of the participants, who worked creatively with the available resources and prepared ‘Masterchef’ worthy dishes! Children relished their own cooking experiments along with the dinner available at the campsite and were ready to call it a night. After a good night’s sleep in their ‘tabins’ (tents with 4 beds), everyone was up before the wake-up call, out in the open, breathing in the fresh air and taking in as much of the scenic location as one can. The day had a lot in store, so a heavy breakfast came to the rescue! 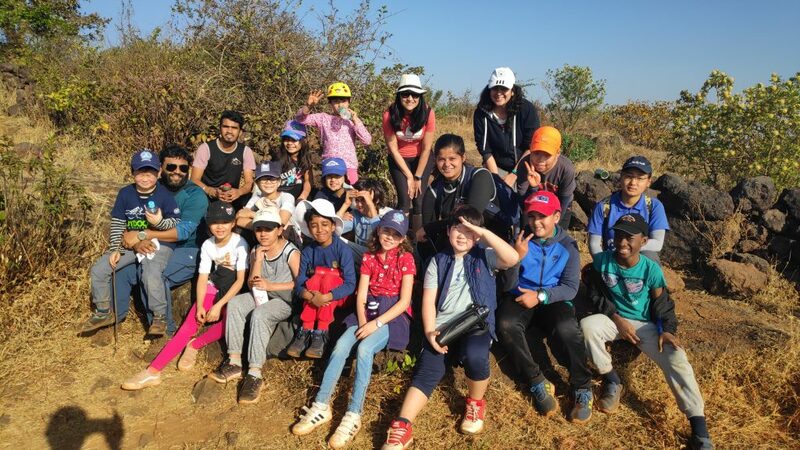 Hiking their way to an elevated portion of one of the five plateaus of ‘Panchgani’ (panch – five, gani – plateaus), children were geared up for rappelling down the cliff edge. 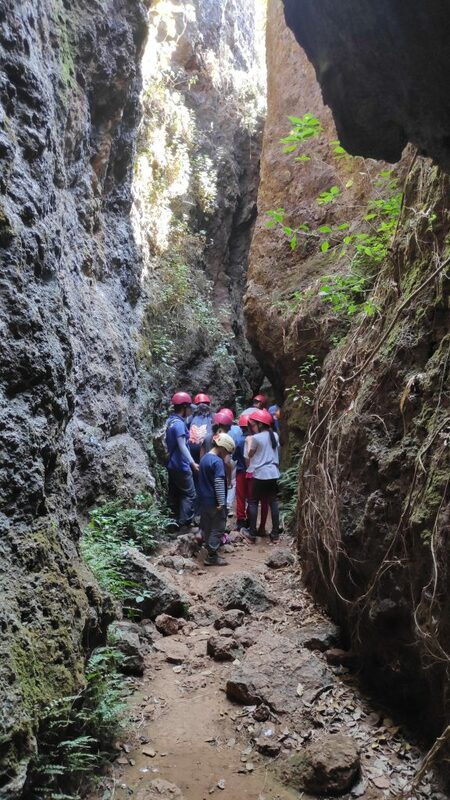 They encouraged each other as they descended down towards the forested area, where they all assembled to explore a rocky cave. Hushed voices ensued, so that sound vibrations didn’t disturb the rocks in any way. Creeping and crawling through the rocky enclosures gave the class a chance to use their agile and survival instincts to manoeuvre their way back to the top and head back for a much deserved lunch! The highlight of the evening was the ‘Natskies Space Day Camp’ where PYP 3 were given a glimpse of some space exploration activities. Assembling a rocket to launch it with a manual propeller, a quick chemistry experiment to visualize how aviation fuel works, a telescope assembly session, puzzle solving without any communication among team members, eating space food, and a trip to the NASA observatory were the activities that had our young learners assume the roles of ambitious astronauts! The activities were a great way to build on their prior knowledge, preparing them for an upcoming unit on ‘Space’, which also facilitated our young learners to use their reasoning and problem-solving skills to inquire further into the wonders of the universe! To wrap up a long and eventful day and get some respite from the cold air, a bonfire was started, giving everyone a chance to huddle around the warmth of the fire, sing songs and play games. Yawns were the perfect signal to call it a day and kids headed back to their last ‘sleepover’ in their tents. Our early-risers were enthusiastic and ready, and the secret behind their promptness were two words – ‘Strawberry-Picking’. Baskets in hand, they carefully tried to tread along the strawberry fields, picking only the luscious, red berries, ready to be picked. While munching on the fresh berries, children walked back for a quick obstacle course activity. Their eventful field trip was inching towards the finish line as the children headed towards the bus, excited for a quick trip to ‘Mapro Garden’ to shop for some goodies before they were homebound! Natventure gave PYP 3 a chance to : relax in natural surroundings, overcome their fears and participate in adventure games, collaborate and encourage each other, witness how locals thrive in nature, inquire into the wonders of space, and work independently on day-to-day activities, away from the comfort and daily routine back in the city! PYP 3 is grateful to Mr Monish, and all associated with Adventure Mantra and Natventure, without whom our learning vacation wouldn’t have been possible!